Penn State University astronomers using the world's largest radio telescope at Arecibo, Puerto Rico, have discovered flaring radio emissions from the ultra-cool star J1047+21 33.6 light years away in the constellation Leo, known as a brown dwarf, which is not much warmer than the planet Jupiter, shattering the previous record for the lowest temperature at which radio waves had been detected from a star. The discovery of J1047+21 could boost the odds of discovering life elsewhere in the universe. The detection technique may be used to hunt for giant planets outside our solar system. The leader of the discovery team also led the discovery of the first planets ever found outside our solar system. Penn State University astronomers using the world's largest radio telescope, at Arecibo, Puerto Rico, have discovered flaring radio emission from an ultra-cool star, not much warmer than the planet Jupiter, shattering the previous record for the lowest stellar temperature at which radio waves were detected. The team from Penn State's Department of Astronomy and Astrophysics and the Center for Exoplanets and Habitable Worlds, led by Alex Wolszczan, the discoverer of the first planets ever found outside our solar system, has been using the giant 305-m (1000-ft) telescope to look for radio signals from a class of objects known as brown dwarfs. These objects are small, cold stars that bridge the gap between Jupiter-like giant planets and normal, more-massive, hydrogen-fusing stars. 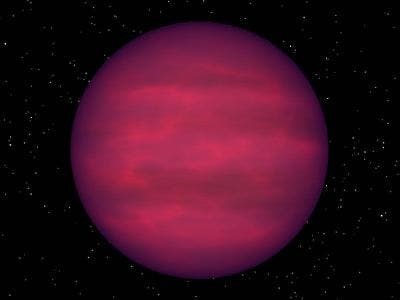 "This object is the coolest brown dwarf ever detected emitting radio waves — it's half the temperature of the previous record holder, making it only about five times hotter than Jupiter," said Matthew Route, the lead author of the discovery paper, said. "The new radio-star is much smaller and colder than our Sun. With a surface temperature not much higher than that of a giant planet, and a size comparable to Jupiter's, it is scarcely visible in optical light. Yet the radio flares seen at Arecibo show it must have a strong magnetic field, implying that the same could be true of other similar stars." "This is a really exciting result. We hope that in the future we'll be able to detect yet colder brown dwarfs, and possibly even giant planets around other stars," added Wolszczan, an Evan Pugh Professor of Astronomy and Astrophysics, and the leader of the project. The possibility that young, hot planets around other stars could be detected in the same manner — because they still maintain strong magnetic fields — has implications for the chances of finding life elsewhere in our Milky Way Galaxy, Wolszczan explained: "The Earth's field protects life on its surface from harmful particles of the solar wind. Knowing whether planetary magnetic fields are common or not throughout the Galaxy will aid our efforts to understand chances that life may exist beyond the Solar System." The discovery of radio signals from J1047+21 dramatically broadens the window through which astronomers can study the atmospheres and interiors of these tiny stars, using the radio detection of their magnetic fields as a tool. At the temperature of this brown dwarf, its atmosphere must be made of neutral gas, which would not give off radio signals like those seen. The energy to drive the signals is likely to come from magnetic fields deep inside the star, similar to the field that protects the Earth from dangerous high-energy particles. By monitoring the radio flares from J1047+21, astronomers will be able to tell how stable the magnetic field is over time, and, from flare duration, they can infer the size of the emitter itself. The results were published in the March 10 2012 edition of the Letters section of the Astrophysical Journal.